Event Alert: IHRC Report on Bahrain to be launched at House of Lords, Monday 11 October. The IHRC Report “Broken Promises: Human Rights, Constitutionalism and Socio-economic Exclusion in Bahrain”, by Omar F. Ahmed, will be launched at a Press Conference at the House of Lords on Monday 11 October, 2010. It will take place at 10.45am, in Committee Room 3 of the House of Lords, London, SW1A 0PW. The event, hosted by Lord Avebury, the Vice-Chairman of the Parliamentary HR Group, and the Bahrain Centre for Human Rights, will focus on the Report’s confirmation of the Bahraini state’s use of torture against political dissidents. This is an issue which particularly topical as the country is currently in the midst of a massive crackdown against political opposition and civil society activists in the run up to the elections scheduled to take place on 23 October. Omar Ahmed, the author of the report, will speak at the launch. His report is based on research into the situation in Bahrain done during 2009-10, including trips by IHRC observers to monitor politically sensitive trials in the country. 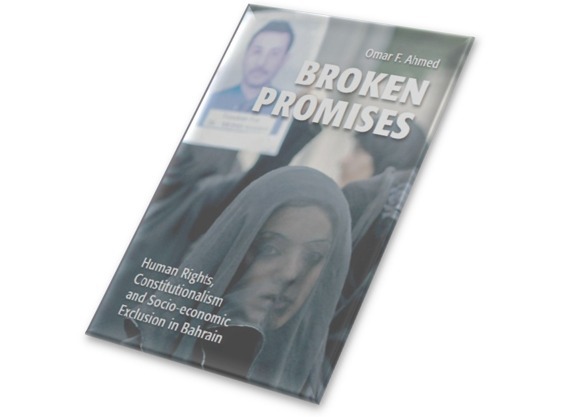 For more in the report, see: Forthcoming: Broken Promises: Human Rights, Constitutionalism and Socio-Economic Exclusion in Bahrain. For more information, please contact the office on the numbers or email address given below.